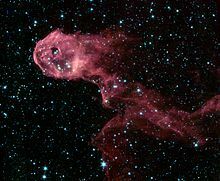 For similarly the named type of formation in other nebulae, see Elephant trunk (astronomy). ^ Matthews, H. I. (1979). "High resolution radio observations of bright rims in IC 1396". Astronomy and Astrophysics. 75: 345–350. Bibcode:1979A&A....75..345M. ^ Barentsen, G. (2011). "T Tauri candidates and accretion rates using IPHAS: method and application to IC1396". Monthly Notices of the Royal Astronomical Society. 415: 103–132. arXiv:1103.1646. Bibcode:2011MNRAS.415..103B. doi:10.1111/j.1365-2966.2011.18674.x. This page was last edited on 13 October 2018, at 06:13 (UTC).